Network Branded Prepaid Card Association - Did We Learn the Right Lessons From the Great Recession? Did We Learn the Right Lessons From the Great Recession? Following is an edited transcript of the conversation. Knowledge@Wharton: In researching this book, did you find that there are still a lot of questions about what caused the recession? Tamim Bayoumi: What I tried to do with this book was not to look at the immediate causes, which is what a lot of people have focused in on. We’ve had a lot of books about the rating agencies and things like this. What I tried to do was take a step back and tell a story about the deep origins to the crisis. What were the deep forces that led to a situation where the failure of a medium-sized U.S. bank plunged the entire North Atlantic area into a deep, deep recession and the Euro area into a full-blown depression? I think there are a couple of things that are not well understood. One, it was a North Atlantic crisis. It was not a global crisis, and other people focus on either the U.S. side or the European side. In my view, those two sides were intimately linked. A significant part of the financing for both the problems in the U.S. and the problems in Southern Europe came from the Northern European Banks. They played a very central role in the entire story. Knowledge@Wharton: We still hear about banks involved in nefarious schemes out there. Is it concerning to you that some banks feel like they are untouchable? Bayoumi: I think there is a feeling that, given the size of the crisis, the banking system has become stronger than you might expect. But I think that the most important thing here is that regulation has been tightened, including on the investment banks. Part of my story is to understand the difference between the commercial banks — like Wells Fargo — and the investment banks, like Morgan Stanley. There was a difference in the way that they were regulated, and that allowed a lot of the excesses to occur. Much of that has been dealt with, but there is still quite a lot of work still to be done. Knowledge@Wharton: The Dodd-Frank Act had a big impact on financial reform in this country. There’s a concern about whether the legislation will be amended or even repealed. But without Dodd-Frank, we could have been looking at other crises. Bayoumi: Dodd-Frank was really good. The real question at this point is, what will happen to that legislation going forward? I just mentioned this difference between commercial banks and investment banks. Part of my story is that the investment banks were not very well regulated, and that allowed a lot of excesses to happen. There has been talk about bringing back Glass-Steagall (repealed in 1999), which would be a separation of commercial banking from investment banking. If you did that, you could end up back in a situation where the commercial banks were much more strongly regulated than the investment banks, which could create opportunities for a weakening of the banking system as a whole. Knowledge@Wharton: Why had financial regulation become so lax leading up to the crisis? Bayoumi: Actually, U.S. commercial banks were reasonably well-regulated. The real story of a loss in regulation was in Europe, where regulators allowed the major Northern European banks to use their own internal risk models to calculate capital. There was loose regulation of the investment banking industry. But there the story is less that the regulations got looser; it’s that the investment banking industry got so much larger. In 1970, investment banks had their own assets with 2% of GDP. By 2008, their own assets were 30% of GDP, yet there was no change in their regulation. As I mentioned earlier, part of my story is that it was the North European banks that financed quite a lot of both the U.S. subprime mortgages and the excesses in Southern Europe. When the U.S. and Southern Europe went into crisis, it went back to Northern Europe. That’s what made it a North Atlantic crisis. There were very significant problems in Northern Europe. In fact, Europe essentially went through its own banking crisis. Knowledge@Wharton: Was the regulatory landscape in the U.S. similar when you went back 20 or 30 years? Bayoumi: The story in the U.S. is a relatively similar regulatory landscape. What happened there was that the fulcrum of the banking system moved from commercial banking to investment banking, and there was a difference. The investment banks were much less tightly regulated. But in Europe, the story was different. In Europe, the major banks became less and less strong because they were allowed to use their own internal risk models. This was a decision made in the mid-1990s, which took a long time to play out since it wasn’t until 2008 that the crisis actually happened. Knowledge@Wharton: I don’t think most people realize there was a long buildup to the crisis. Bayoumi: I agree with you. A lot of the books are about what happened in 2006, 2007 and 2008. My book says that past about 2003, most of the basic forces were in place and most people were sleepwalkers. The thing was on a path to a crisis, and very little could have avoided it. Knowledge@Wharton: Why haven’t we seen some of the banking executives face criminal prosecution for their roles in the crisis? Bayoumi: That’s a very, very good question. I think part of the story, at least in Europe, was that while Europe had a banking crisis, the governments were not really prepared to admit to the banks being in crisis. There was a certain amount of minimizing the problems and allowing the banks to “extend and pretend,” which is where you don’t admit to all of the bad loans. The question in the U.S. is more complicated since there was acknowledgement that there had been a crisis. But I think a part of it was that at a time when you have such fragility in the banking system, going after people might have been regarded as something that would have pushed things over the edge. That’s the only explanation I have. Knowledge@Wharton: There were so many factors that went into the crisis that we’re still learning about, correct? Bayoumi: I think the true story of the origins of the crisis have yet to be agreed across people. There’s a lot of loose talk about, “Well, it was just a bunch of investment bankers who were being naughty.” Investment bankers are greedy. That’s kind of how they work. But there’s a lot less looking at what were the underlying forces that allowed those bankers to become so important. I spend quite a lot of time in the book talking about Europe, and there I think there are still lessons to be learned, in particular about the design of the euro area. It was very badly designed for a banking crisis in that it was very difficult to give support to banks. I think that’s one area that we need to think about. I think there’s a wider area that we need to think about in terms of how economists can regain the trust of people and be moved back to being regarded as experts who know what they’re doing. That requires a bit of rethinking about some of the ways that we think about the connections across the world. I’m much more focused on the financial connections between countries and within countries, and rather less worried about the consumption function or whatever. Knowledge@Wharton: But does the structure of Europe still present potential problems? Bayoumi: Yes. The story I tell in my book is about the constant tension between the French and the German view about what the single currency was about. The French thought you needed a single currency in order to get an integrated economy. Therefore, you should support countries along the way if they got into trouble. The Germans thought you should only bring in the single currency once you got an integrated economy and, therefore, didn’t need to support [it]. Part of the problem with the euro area is what you ended up with was a bit of the worst of both worlds. You got the French early currency with the German no-bailout clause. They’re still working that all out. You can see it in the latest suggestions, for example, by President Macron of France, about a euro-area finance minister. Again, the French and the Germans have different plans about that, which are exactly the same thing. Knowledge@Wharton: Will it be difficult to get every country in the euro area on the same page? Bayoumi: Moving forward with the architecture of the euro area and making it better is a very, very difficult process. President Macron has just started quite an ambitious plan, but it’s now being watered down because different people have different views. There is no one person in the middle to say, “This is how we go forward.” It’s still a work in progress, and it’s still got a lot of weaknesses. Knowledge@Wharton: How will Brexit affect the stability of the single market? Bayoumi: The complication with Brexit is that London is effectively the financial capital of Europe. You have this odd situation where you have the financial capital physically outside of the euro area. With Brexit, depending on how it’s agreed, a lot of that may move to other parts within the euro area. But it may well get splintered, and you could end up with a situation in which the financial system becomes much more difficult to control as different countries and cities compete for that financial pie. Knowledge@Wharton: There was a long-held belief that the markets had the ability to keep control over the banks, but that wasn’t the case. Is it the case now in Europe? Bayoumi: The belief that you could control banking simply through market forces was what caused these banks [to be] allowed to use their own internal risk models to define how much capital support they had for their loans. That is being very slowly changed in Europe. But to this day, most of the large European banks are only using their own internal risk models to define the capital behind their loans. Why would you let somebody define their own capital buffers rather than asking a regulator to do it? Now, the regulators look over these models. Nevertheless, I document that this ability to use your own models was abused before the crisis, and I think that there still needs to be more work on that. Knowledge@Wharton: What are your thoughts about banking regulation in the U.S. going back 30 or 40 years? Bayoumi: The history of the U.S. regulation is an interesting one. If you go back to the early 1980s, the U.S. had banks that were limited to each state. Essentially, you didn’t have interstate banking. What did happen in the U.S., and what actually saved the U.S. from worse harm over the crisis, was a strengthening of regulation after the S&L (savings and loan) crisis. 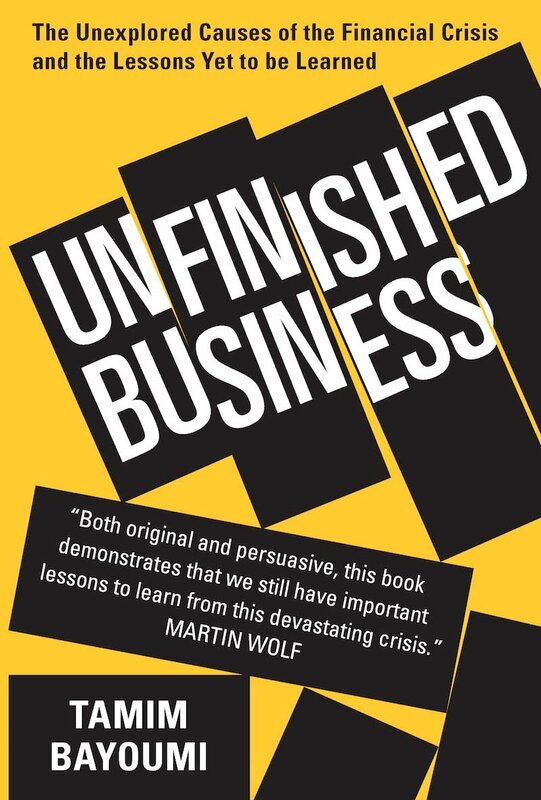 One of reasons that I wrote this book was how come a meltdown, largely in the U.S. housing market, caused a euro-area depression but only a recession in the U.S.? How come the main impact ended up in Europe and not in the U.S.? That’s one of the questions which I try to answer in my book. Knowledge@Wharton: There are still a large number of properties here in the U.S. that are either underwater or in foreclosure. What’s changed in the lending market from a decade ago? Bayoumi: One of the big things that has happened is that the securitization market has not really ever come back. Securitization was where a commercial bank took a bunch of loans, normally mortgages, bundled them together and sold that as an asset. It sold it mainly to the investment banks. This was where the shadow banking system came in. It was selling their loans to people who weren’t under the same regulation, including the investment banks. That market has really not come back. Most banks are holding the mortgages that they actually originate. Clearly it’s safer if you are holding it rather than selling it to somebody else. Knowledge@Wharton: Could a consensus be reached on all sides that would prevent another recession or depression? Bayoumi: There’s just been an agreement in the international community on a set of reforms called Basel III. They’ve been around for a while, but they’ve just finally agreed on it. The good news about that is that it looks to be a fairly good agreement. The bad news is that it’s going to take a long time to get there. They haven’t set themselves any very tight deadlines. In fact, 2027 is when the entire agreement comes into force.